Greetings, dear humans! 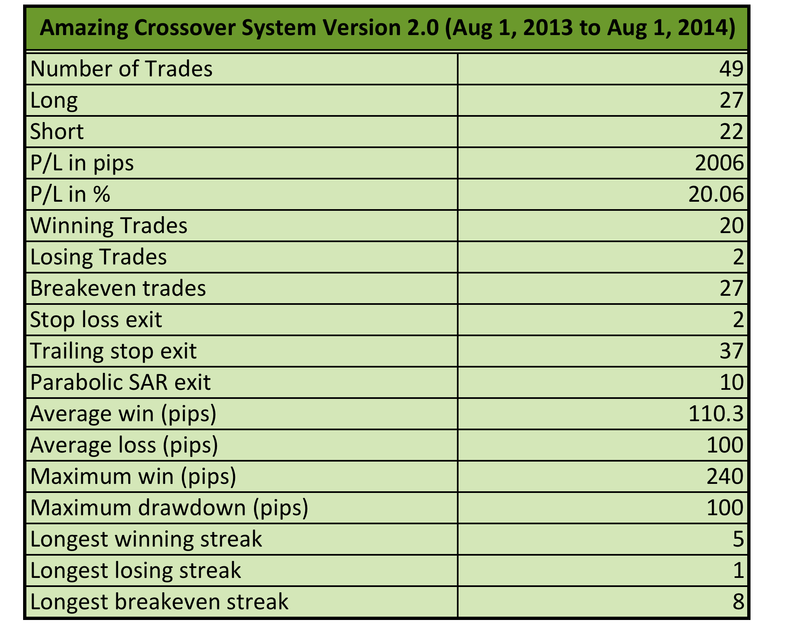 I’m sure y’all are excited to see how the Amazing Crossover System (Version 2.0) fared in the yearly backtests I conducted. For those who haven’t seen the tweaks I applied, make sure you read these revised system rules first. As you can see, the system generated 2006 pips or a 20.06% return in a year, which is pretty amazing. To top it off, only two losses were made as price made a quick reversal in a couple of instances. Not bad! Looking closer into the numbers shows that the maximum win was 240 pips or 2.40% and that the average win was at 110.3 pips, more than a 1:1 return-on-risk based on the initial 100-pip stop. The longest winning streak lasted by 5 trades, yet the system managed to churn out a bunch of breakeven trades as well, thanks to the 20-pip trailing stop. The parabolic SAR seems to be a good PT strategy, as it allowed the position to stay open and maximize longer trends. However, the 20-pip trailing stop may need to be widened when the system is being applied on longer-term charts, as some huge trends were missed on quick pullbacks. I’ll save the rest of my comments when I release my overall review on the Amazing Crossover System (Version 2.0) later on. For now, I’ll be running the forward tests for the month of August. This is your friendly forex robot signing off!